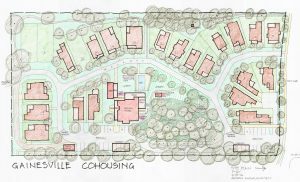 Cohousing is a type of intentional community composed of private homes supplemented by shared facilities. The community is planned, owned and managed by the residents – who also share activities which may include cooking, dining, child care, gardening, and governance of the community. Common facilities may include a kitchen, dining room, laundry, child care facilities, offices, internet access, guest rooms, and recreational features. Gainesville Cohousing is a unique, diverse group of individuals working to create a vibrant and nourishing community in the Gainesville area. The physical and social environment of our neighborhood incorporates principles of sustainability, affordability, and respect for individual privacy and diversity. The physical design of the community is structured to bring people together, enhancing daily interaction, cooperation and fun. As neighbors, we share the conviction that cooperating in everyday endeavors will enhance our lives. Seeking to live both independently as well as interdependently, we strive to balance our needs for privacy and companionship, sharing our skills and resources while respecting each other’s property. Although we are all unique, common design and materials in each home will enhance the neighborhood and reduce costs. 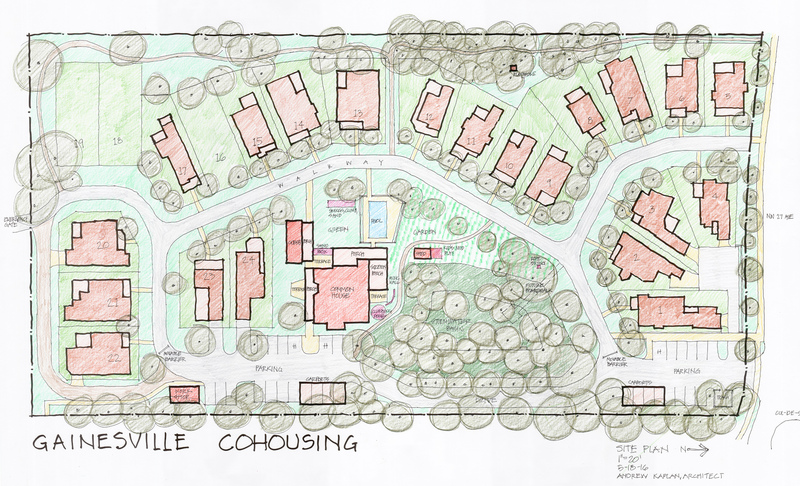 Our cohousing neighborhood includes shared outdoor spaces, workshops and a large common house for socializing, shared meals, and celebrations. Residential units are owned privately. Members contribute their time and talents in the day-to-day maintenance and management of the facilities. Communication is open with clear processes for decision-making and resolving conflicts. Our goal is that everyone is heard and all needs are understood. Combining our intellectual and tangible resources produces benefits on many levels, creating a community which fosters cooperation, goodwill, mutual respect, trust, and tolerance; and inspires similar forms of neighborliness among citizens throughout our region.